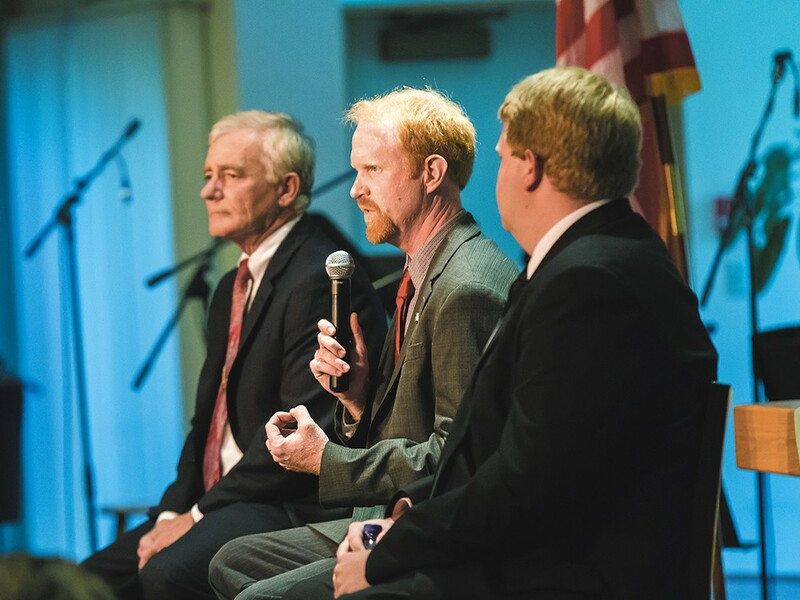 State Sen. John Smith responds to a question at the debate where he faced off with Mike Brunson (left) and Brian Dansel (right). At a debate last Wednesday among candidates vying for northeast Washington’s red-blooded 7th District Senate seat, Spokane County Republican Party vice chair Jill Stephenson’s introductory remarks were punctuated by a man seated in the pew at Covenant United Methodist Church: “No Democrats!” he shouted, quite accurately, drawing spurts of laughter and applause. The appointed incumbent, John Smith, a Colville farmer who led legislative efforts to control the state’s gray wolf population, faces two Republican challengers in the Aug. 6 primary race: Brian Dansel, 30, a Ferry County commissioner, and Mike Brunson, 57, a private investigator from Springdale. The candidates’ views hardly diverged: All extolled small government, American cars and gun rights, and railed against Common Core standards, tax hikes and state-funded bike paths. Nevertheless, two clear front-runners emerged in the post-debate straw poll. Smith edged out Dansel, with 26 votes to the commissioner’s 22. Brunson lagged behind with four. The two candidates with the most votes in the primary will advance to the general election on Nov. 5.